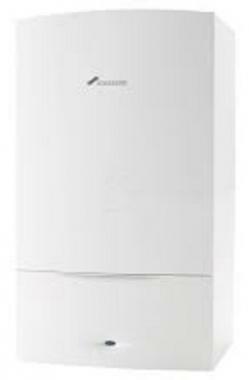 The Greenstar 15i system boiler is one of the most popular models by Worcester Bosch. It is a wall mounted system gas boiler, perfect for a medium or large sized home. It has an output of 15kW and an efficiency rating of 94% making it an A rated boiler. The Greenstar i is able to fit in a standard sized cupboard helping to keep it hidden away. It is compatible with a wide range of accessories such as the Greenskies solar panels, combining this with the boiler would allow for better energy saving as well as reducing your bills down. This model is suitable for homes where heating systems includes a hot water storage cylinder, meaning it could be used in conjunction with Worcester's Greenstore cylinders - another way to add efficiency onto your boiler. This boiler comes with simple controls and displays clear information and a wide choice helping to maximize the comfort and economy. The Greenstar comes with a low energy pump that can help to reduce the electrical usage as well as the large condensesure style siphon that is built into your boiler and means that your boiler has no risk of frost damaging the boiler if installed in a garage or loft. The Greenstar 15i system gas boiler comes with 5 years warranty to give you just more added security that you have a reliable boiler.